This is one of my first soon to be bonsai started in spring 2011. I got the boxwood from local home depot. It's only been pruned/shaped, and is still in the original nursery pot. I like the double trunk it has. It has a lot of vigor and needs to be pruned every week =). This year 2012 I hope to get the leaf pads more condenced and seperated from each other. 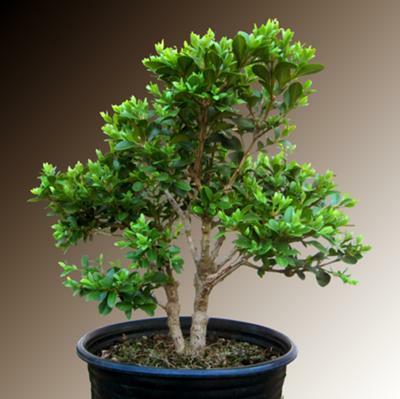 I will get bonsai training pot for it as soon as it looks ready. Picture notes: I took the picture on white background, added gradient, and enhanced the color in photoshop. Hello, nice little one ... it look good and as you said the shape is nice too... I could not see the real size of it...maybe another angle is better... keep the good work!